Flights from Australia to Bali, and also from Bali to Australia were closed due to the eruption of Mount Rinjani. The eruption of Mount Rinjani resulting ash in seven villages, and the temporary closure of the airport in Denpasar and Lombok. All flights Virgin Australia and Jetstar canceled, while at least 13 flights of one airline is also disturbed. At Ngurah Rai Airport, Denpasar, Bali, passengers stranded due to flight delays or cancellations, meet the waiting rooms. They are waiting for departure. The eruption of Mount Rinjani occurred Tuesday, November 3rd, occurred several times since morning. High eruption reached about 3500 meters above sea level, or about 1000 meters above the crater Barujari. Ashes is very smooth and the wind to the west. 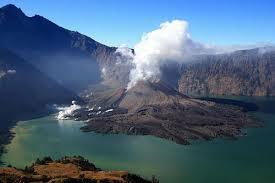 Mount Rinjani covers an area of ​​East Lombok, Central Lombok and North Lombok, West Nusa Tenggara Province. Seven villages in North Lombok regency experienced ashfall. So that citizens affected Lambok should wear to protect respiratory master. Based on the Terra satellite image, the distribution of volcanic ash covered the Lombok Strait, parts of Bali, the Bali Strait to Banyuwangi. Thin ash rain also hit those areas. Mount Rinjani is already in alert status level II, since 25 October. Advanced eruption is still possible, given the number of tremors that lasted 5-10 seconds. By the eruption of Mount Rinjani, communities around Mount Rinjani, also visitors or tourists, may not perform activities especially camping in the caldera of Mount Rinjani and within a radius of 3 km from the crater of Mount Barujari inside the caldera of Mount Rinjani.